Betty Mae Tiger Jumper is an inspirational woman who demonstrated character, courage, and commitment during her life. 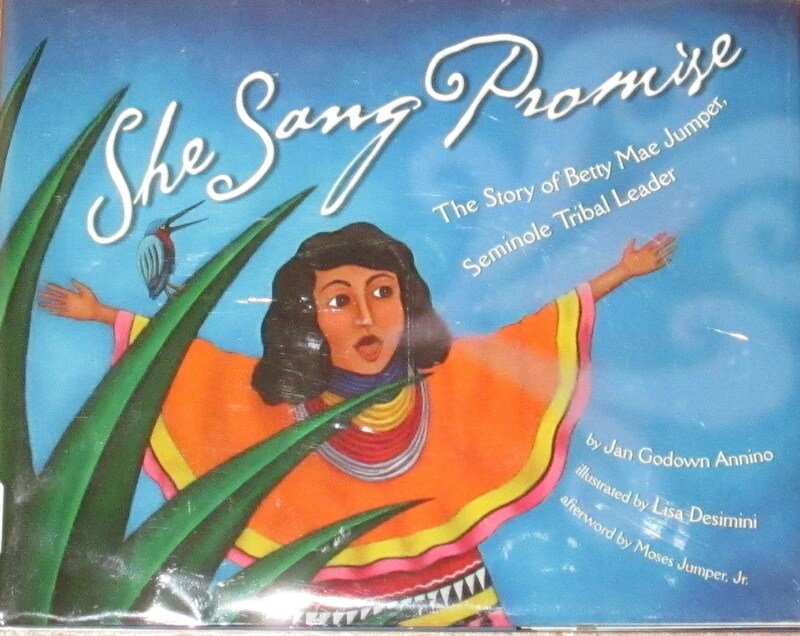 The picture book biography, She Sang Promise: The Story of Betty Mae Jumper, Seminole Tribal Leader, by author, Jan Godown Annino, describes her life as a member of the Seminole Tribe in Florida. As a small child, Betty Mae learned tribal medicine, traditions, stories, and legends of the Florida Seminoles. When Betty Mae heard about reading, she pleaded with the Elders to send her to school. She was a quick learner and eventually went on to become a trained nurse. Returning home to the people she loved, Betty Mae convinced women to trust her new medicine and helped many suffering from diseases. It seemed there was nothing Betty Mae couldn’t do. When her husband was sick and unable to work, she took over for him and wrestled alligators. When the U.S. government asked the Seminoles to organize a Tribal government to work with leaders in Washington D.C., she became the “voice for her people.” And when it came time to elect a Tribal leader, Betty Mae asked for votes. She was the first woman to be elected a leader of the Seminole Tribe in Florida. In a man’s world, Betty Mae Jumper sang promise to all. Throughout her life, she never forgot where she came from and continued to keep alive the stories and traditions of the Seminoles. The illustrations by Lisa Desimini are in bright jeweled colors that depict time-honored aspects of the Seminoles. Like the title, She Sang Promise, this book is uplifting and serves as an inspiration to young girls and boys who have the character, courage, and commitment to succeed! Susan B. Anthony, a well-known woman in history, displayed character, courage, and commitment in her quest to achieve a woman’s right to vote. 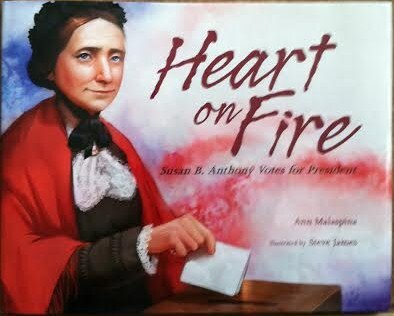 In the picture book, Heart on Fire: Susan B. Anthony Votes for President, written by Ann Malaspina and illustrated by Steve James, the reader is given a look into an important event in the life of Susan B. Anthony. 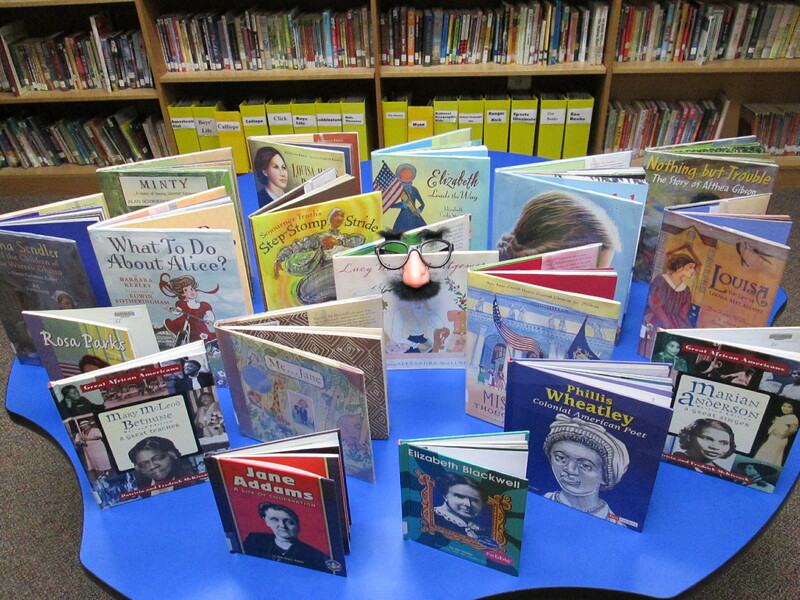 It’s another perfect book to celebrate Women’s History Month. Using free verse, the author describes how Susan B. Anthony believed the manner in which the fourteenth amendment was written gave women the right to vote. Despite objections from inspectors at the registration office, Susan B. Anthony registered to vote. On Election Day in 1872, she and fifteen other women went to the polls and voted for president. That spelled trouble. Susan B. Anthony was arrested for not having the lawful right to vote. Outrageous, Unbelievable, True is a phrase repeated by the author as she depicts this event in Anthony’s life. At a jury trial, Anthony was found guilty and fined. She spoke out with passion about her rights and declared she would never pay a dollar of the fine. Back matter in the book reveals what happened to the fine and how Susan B. Anthony continued to fight for the women’s suffrage amendment. With character, courage, and commitment, Susan B. Anthony helped pave the way for women’s rights. One woman who demonstrated these characteristics was Moina Belle Michael. If you’ve ever seen a veteran wear a red poppy, Moina Belle Michael is the woman behind the flower. 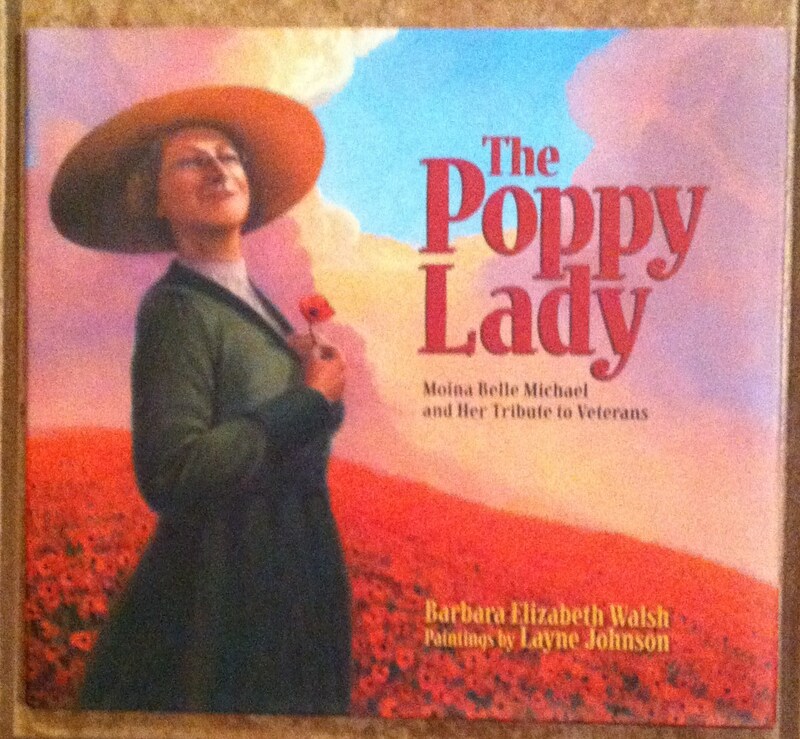 The Poppy Lady written by Barbara Elizabeth Walsh and beautifully illustrated by Layne Johnson tells the story of a woman with a cause. When World War I broke out, Moina Belle Michael wanted to do everything she could for the soldiers who fought for our freedom. The poem, “In Flanders Field,” that gave tribute to soldiers who had died on the battlefield moved and inspired Moina. The description of the red poppies blowing between the white crosses that marked the soldiers’ graves gave Moina an idea. She wanted to make the red poppy a symbol to honor and remember soldiers. For the rest of her life, Moina Belle Michael worked diligently to ensure the symbol of the red poppy was recognized by all. An added treat to this book is the interesting back matter the author includes about “The Poppy Lady” and the symbol. There are long lists of women in history who have demonstrated character, courage, and commitment. We need strong women to act as role models for our younger generation to encourage them to reach their goals and full potential. What woman in history inspired you?